I don’t know if you ever had the experience of being in a country were you don’t understand the language. And I don’t mean not being able to speak it, but really having no clue of anything anybody is saying, or what is written around you. It is very interesting because in a way you feel like a child again. I felt like a toddler when I arrived, not being able to decipher the signs on the street, not understanding what all people are talking about, maybe about you? But being full of curiosity about this strange reality and learning new things every day. So when I went to Beijing to spend a couple of days there, it was as if I had ran away from home whilst not really being capable of making sense of the world around me. Walking out of Beijing railway station was strange, it was very busy in front of the station, but walking on the broad street going from the station to the city all people seemed to have dissolved, left and right were banks, hotels and companies. On the sunny sidewalk just autumn leaves were dancing around in the wind, and being swiped on a heap by some workers with willow-branch made brooms. 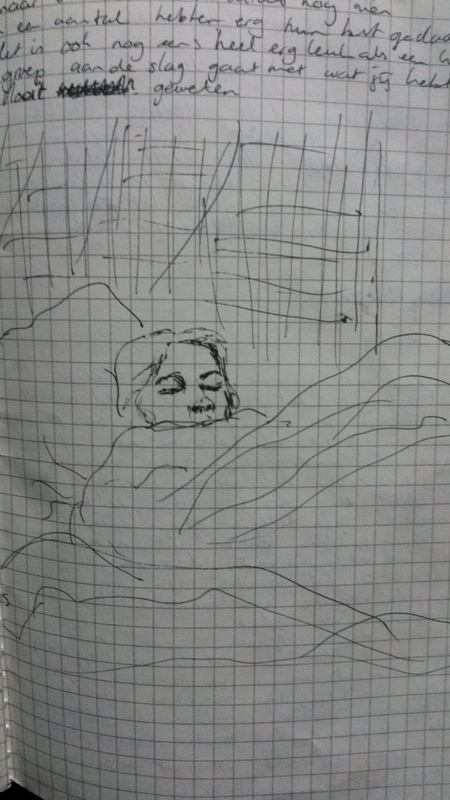 I had to contact the landlord of the apartment somebody rented for me, to let him know when I would arrive, but my phone battery didn’t made it through the six hour train ride. No starbucks or other coffee place to be seen so I went into the biggest hotel and had a tea while charging it. The landlord could not speak English and kept on sending me we chat messages in Chinese, so I hoped the translation was correct and with the address I went to a taxi. 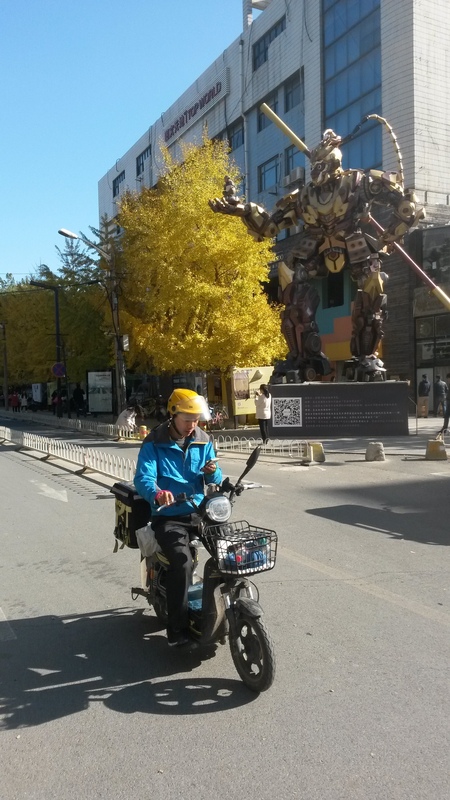 The driver did not seem to understand what I wanted or where to go – whoever told me that in Beijing many people speak English was lying – but after a while and a lot of ‘we chatting’ and cursing the internet connection I ended up at the right apartment complex. I had an apparent number, a room number and a code, that was it. And when I found the flat, the right floor and opened the right appartment (no numbering in a dark damp hallway) there were five rooms of which four had to be opened with a code and one white one that closet door, I didn’t know which one was mine, none of the doors opened. A Chinese woman that came out of room B threw some irritated words towards me when I tried to ask her something. I had no internet connection in the building and when I tried to call I had no network, meanwhile my phone started beeping because it needed to be charged again. Tired and angry with the landlord and myself for not being informed better I went out again. In a little coffeeshop nearby I found a plug, and I could make contact again. 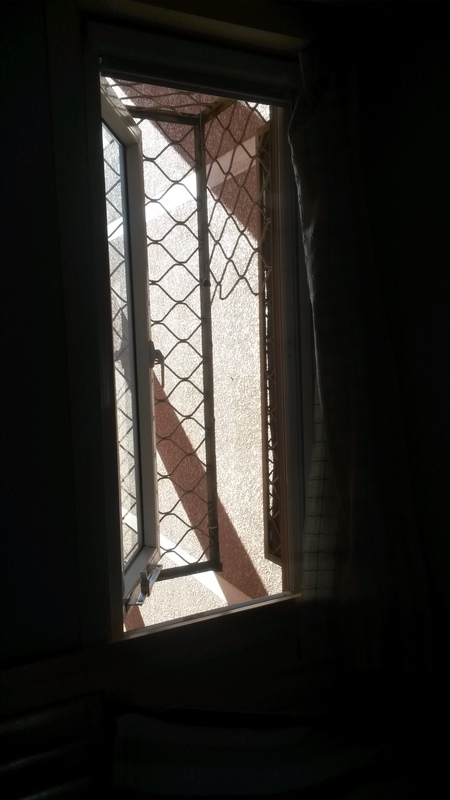 It turned out the white door that didn’t open on my first try was my room, the handle was just a bit stuck, and keys were on the bedside table. When I managed to open it I saw what seemed like a closet with a bed in it, a little window with an iron fence that looked out upon a nook in the building and a busy street. The mirrors on the closet at the foot end of the bed had given it a much bigger appearance on the website, very smart. 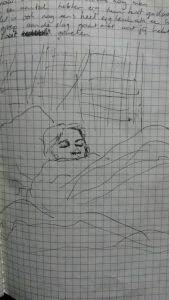 But at least I was in my room and I could relax, and I let myself fall on the seemingly wooden mattress. 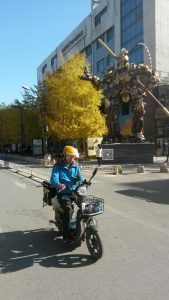 The next day I went looking for the metro and took one towards the 798 area, the art district of Beijing. Again an old factory was turned into an art space. But it turned out it had been a big factory because the area stretched out over a large terrain with streets in between. And the numerous big old factory buildings, the brick chimneys, the rusty pipes and metal constructions looked beautiful in the afternoon sun. 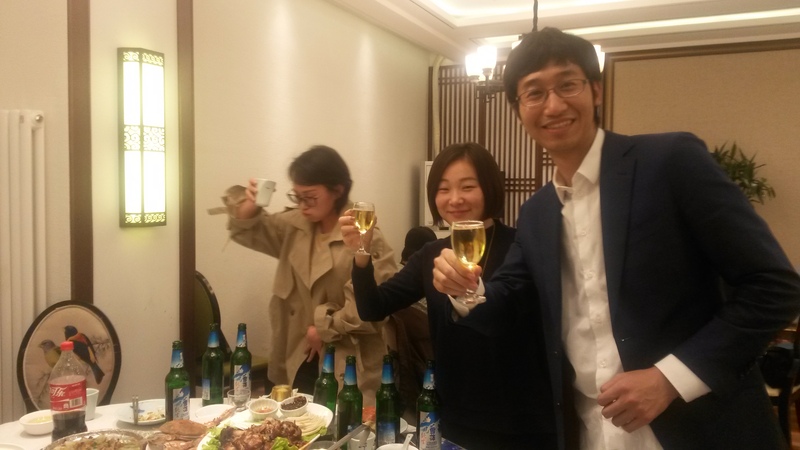 I had been invited to an opening by Wouter and Ling, a couple based in Dalian who run an animation studio. And it was a good opportunity to talk with some of their colleagues and acquaintances. The opening was something I had never seen. A real estate company sponsored the exhibition held in the gallery, and they used the room and the art filled walls and atmosphere to give a presentation for their clients. Women in white dresses handed out goodie-bags and showed us – like living dolls – the way towards the room. A stage was set up and waiters walked around with drinks. For the ‘opening’ a couple of representatives took jars of gold colored powder and let it slide on a black cloth so letters appeared, when the letters where all complete everybody applauded. I was shown around a bit, and introduced myself to one of the best sculptors of China, the only one allowed to sculpt Mao I was told. The evening ended with a dinner in a restaurant where artists, real estate people and teachers mixed and worked a lot on there “guanxi”, the relations between people that help you forward. 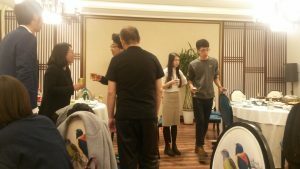 The evening started with people sitting stiffly on their own table, but when the Chinese beer started flowing, and more and more toasts were given everybody started mixing, in the end everybody was standing, talking, drinking and embracing each other. I gave one toast too, so lets hope I have a tiny little bit of guanxi too now. The next day I had to get up very very early for my standards. 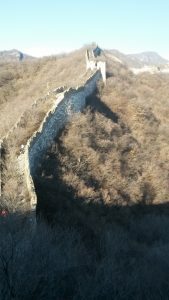 But with a good reason, I signed up for a hike on the great wall. To get to the area of the wall we had to drive around two hours with a bus, during which the tour guide introduced himself and his colleagues to the group, mostly expats and some sporty tourists. 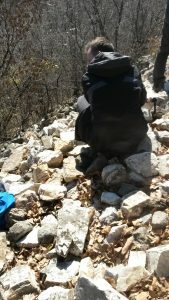 We went with no less than three guides on the hike, one walked ahead of us and placed ribbons in the threes, one behind us to wait for the last people and one in the middle who could help and took some pictures too. We started on a mountain trail and had to climb one and a half hours towards the wall. At one moment we had to climb 300 meters over a path that was a collapsed part of the wall. My hands got a bit sweaty when I had to pass a woman in the middle of the path and left and right of me I saw not so much ground, but just steep mountain with more rocks and loose stones. When we arrived on the highest point we were at the ‘nine eyes tower’, a tower that has nine windows on one side and seems to watch over the valley with its dark eyes. 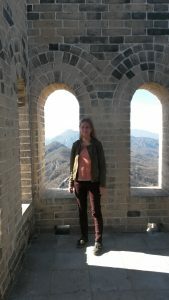 It was stunning, the sky was clear, it was sunny and fresh but not cold, and when I climbed on the tower I could look thousands of meters on all sides. When we walked on we had a brief restored part, but most of the 8 km we walked on old, unrestored wall of which the last parts had been finished in the fourteenth century. 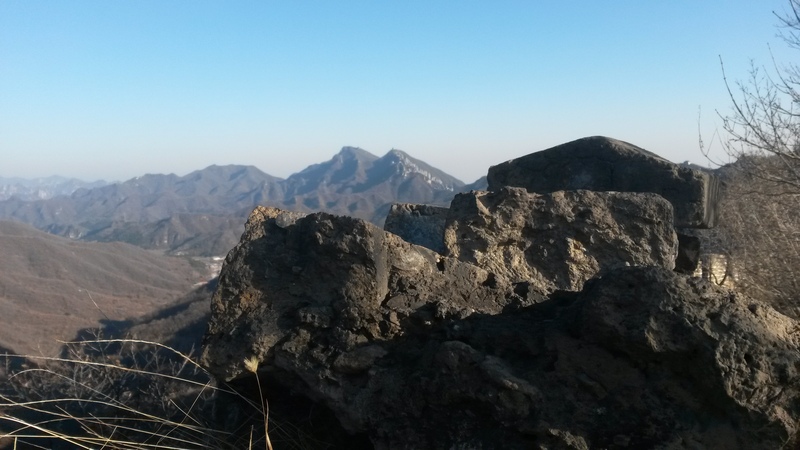 I walked a big part alone, and besides the occasional Chinese hiker I saw no one, a crow flew over the valley and made a long screeching noise that echoed in between the mountains, I imagined the area in 1368 and thought it probably didn’t change much. Completely happy and satisfied I sat in he bus back to the centre of Beijing, when the full moon appeared above the skyline, looking enormous in between the slim elongated silhouettes. 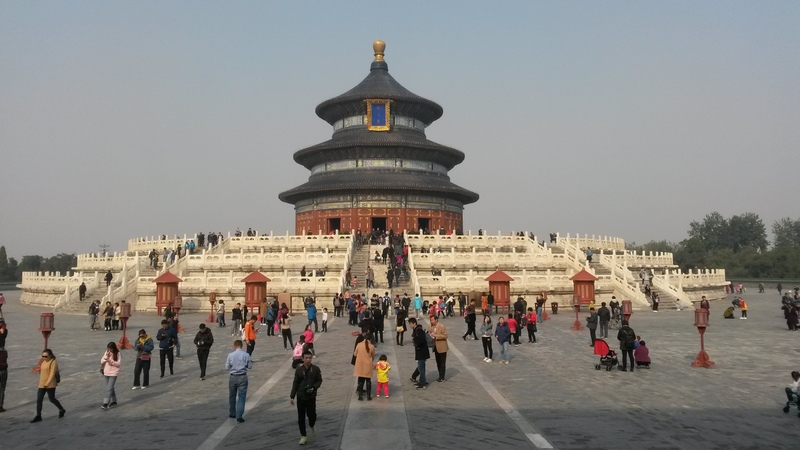 The next day I visited the temple of heaven, but I could not enjoy it as much as I wanted. It was so crowded I had to stand side to side with around a hundred people on the stairs to the wall of echoes, just to be able to see it for a full five seconds. Also I was afraid I would loose my train back to Dalian, here taking a train is more like taking a plane, with all the checks and the amount of people departing every hour you can’t arrive a couple of minutes before departure time and catch it. And even though I left with more than one hour to take three metro stops I just got on it 15 minutes before it left, and was one of the last to do so. So now I am back in Dalian, in the studio, writing this last blog. When you read this I will probably have already checked in and walked into the plane, flying me all the way back to the Netherlands. I can’t wait to tell everybody all the stories about China, this strange and funny country of which I got a glimpse the last weeks, and all the people we met here and who became a part of our lives. And I want to continue working on all the ideas I got here. But I am afraid I will miss it more than I would like to. Posted on November 6th, by Marlies in Blog.